What's it about? 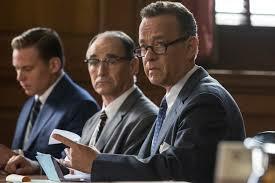 During the Cold War, insurance lawyer James Donovan (Tom Hanks) represents captured Russian spy Rudolf Abel (Mark Rylance) in court, only to find himself tasked with negotiating the tricky exchange of Abel for the US pilot Gary Powers, who has been captured by the Soviets. Is it any good? Everything about Bridge of Spies screams quality. The storytelling is crisp, the photography is immaculate, the recreation of 50s/60s Brooklyn and Berlin is superb and the lead performances quietly assured. Make no mistake - it's a confident, good film, the sort of film Spielberg can apparently make without even raising a sweat. And yet, it all feels a bit pedestrian, to be honest. Primarily, we never really get a sense of a genuine relationship between Donovan and Abel, which undermines the tension and impact of the climax. As with Amistad and Lincoln, Spielberg's reverence for the American Constitution, and the dedicated men who uphold it, is all very worthy, but it makes for rather straight-laced viewing. Frankly, 'good man does good thing for good reasons' is a fine thing to celebrate, but it doesn't sell many papers now, does it? I'd prefer see a little more ambiguity and cynicism in my Cold War spy films. Where I went in wanting to see a high-stakes, duplicitous game of poker, I instead ended up with a civilised, straightforward game of, well, bridge. Anything else I should know? Back in the Cold War I was working as an archaeologist and was having trouble identifying an Egyptian mummy I had unearthed in Cairo. A soviet friend offered to help and called in some KGB pals of his. A few hours later, they came to tell me that the mummy was called Amenkhotep II and had lived around 2345BC. 'He confessed.' replied my comrade. What does the Fonz think? Set partly in Berlin, but didn't really take my breath away.